Under future scenarios of business-as-usual emissions, the ocean storage of anthropogenic carbon is anticipated to decrease because of ocean chemistry constraints and positive feedbacks in the carbon-climate dynamics, whereas it is still unknown how the oceanic carbon cycle will respond to more substantial mitigation scenarios. To evaluate the natural system response to prescribed atmospheric “target” concentrations and assess the response of the ocean carbon pool to these values, 2 centennial projection simulations have been performed with an Earth System Model that includes a fully coupled carbon cycle, forced in one case with a mitigation scenario and the other with the SRES A1B scenario. End of century ocean uptake with the mitigation scenario is projected to return to the same magnitude of carbon fluxes as simulated in 1960 in the Pacific Ocean and to lower values in the Atlantic. With A1B, the major ocean basins are instead projected to decrease the capacity for carbon uptake globally as found with simpler carbon cycle models, while at the regional level the response is contrasting. The model indicates that the equatorial Pacific may increase the carbon uptake rates in both scenarios, owing to enhancement of the biological carbon pump evidenced by an increase in Net Community Production (NCP) following changes in the subsurface equatorial circulation and enhanced iron availability from extratropical regions. NCP is a proxy of the bulk organic carbon made available to the higher trophic levels and potentially exportable from the surface layers. The model results indicate that, besides the localized increase in the equatorial Pacific, the NCP of lower trophic levels in the northern Pacific and Atlantic oceans is projected to be halved with respect to the current climate under a substantial mitigation scenario at the end of the twenty-first century. 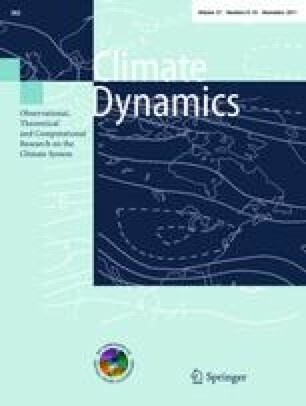 It is thus suggested that changes due to cumulative carbon emissions up to present and the projected concentration pathways of aerosol in the next decades control the evolution of surface ocean biogeochemistry in the second half of this century more than the specific pathways of atmospheric CO2 concentrations. This work was supported by the ENSEMBLES project, funded by the European Commission’s 6th Framework Programme through contract GOCE-CT-2003-505539 and by the Italian FISR project VECTOR funded by the Ministry of University and Scientific Research.We are grateful to the three Reviewers, for their thorough comments and suggestions that have improved the manuscript.